I call him the Marshall. Picture super agents meet old west cowboys. Fedora,buckskin jacket,biker boots, and underneath it all is high tech bodyarmor. The Marshall always has a smile on his face no matter the circumstance. Lamb chop sideburns,and Rayban style shades are his hallmark. Standard issue sidearm in a thigh holster ,and if he is expecting trouble a submachine gun completes the kit. 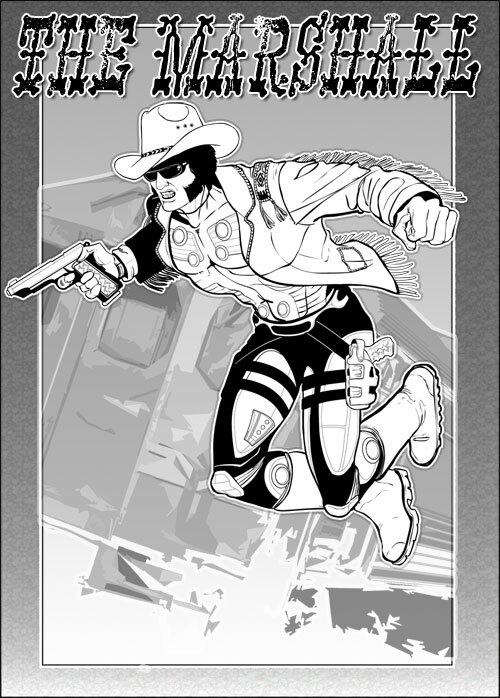 The Marshall is a combo of Nick Fury,John Wayne,and James Bond. Don't miss your chance to win your own custom illustration in Caption Contest 25, going on now! Will that background be appearing in Hero Machine 3? Dunno, that’s way too far away to guess. No reason at this point why it wouldn’t.